eNLokam: Computer pioneer Dennis Ritchie Gone! The world has lost another computer pioneer. Dennis Ritchie, the computer scientist who invented the C programming language and co-developed the Unix operating system, has died at the age of 70. The New York Times reported that Ritchie's body was found in his New Jersey home. According to reports, Ritchie had been treated for prostate cancer and heart disease. News of Ritchie's death comes just days after the death of Apple co-founder Steve Jobs. 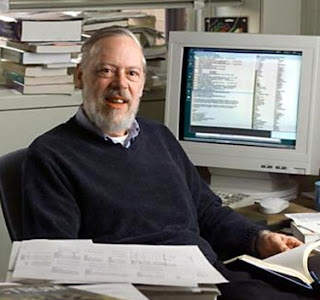 While working at Bell Labs in the 1960s and early '70s, Ritchie served as the principal designer of C and was the co-developer of the Unix operating system. C, renowned for its clear, simple language, would become a vital tool in website development, while Unix is the foundation for computer operating systems such as Apples iOS. Born in Bronxville, NY, Ritchie began working at Bell Labs — where his father was a scientist, earning his Ph.D. from Harvard. He retired from Bell in 2007. In 1983, Ritchie and his Bell Labs collaborator Ken Thompson received the Turing Award from the Association for Computing Machinery. In 1998, then-President Bill Clinton bestowed Ritchie and Thompson with the National Medal of Technology and Innovation for their invention of C and Unix.